Kraft paper bags with flat handle, are available in different sizes to suit all your needs. Ideal for giveaway promo. Can be ordered in unprinted or custom printed, with options including screen print and full colour print available. Add on stickers are also available in different shapes. 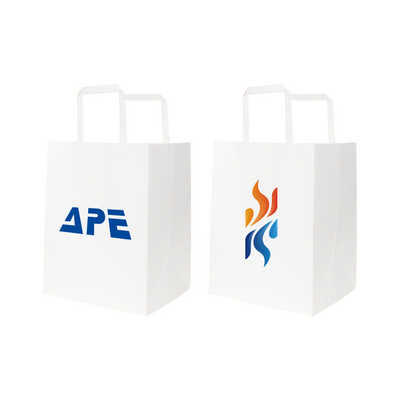 Offered in a variety of paper weights, bag dimensions and graphics to meet your needs. FSC certified materials, ensure your paper source supports sustainable forest practices. Material - 100g paper Colours - Brown, White, for PMS matching, please contact us Product size - 215x165x265mm Print size - 180x220mm. Price includes : 3wk 1 col print/side. Setup is included.